The Musician Spotlight Series shines a light on up-and-coming musicians creating heartfelt and original work across genres, giving them an opportunity to talk about their music, their collaborators, and why they do what they do. 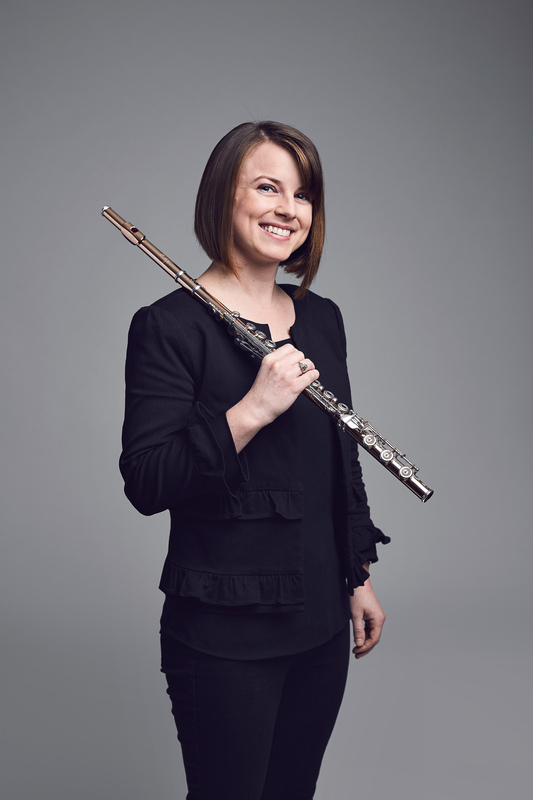 American flutist Kelly Zimba joined the Toronto Symphony Orchestra in 2017 as Principal Flute. She’s performed all over the world as a soloist, chamber, and orchestral musician. Kelly is featured as a soloist in the TSO’s March 9 & 10 concerts, performing a flute and harp concerto by Mozart with Principal Harp Heidi van Hoesen Gorton). Click Here to purchase tickets. What was the first piece of music you ever learned? I vividly remember plunking through “Mary Had a Little Lamb” at age nine, about two weeks after picking up the flute for the first time. After every single note, I had to stop and turn my head to the right to look and see where my fingers needed to go next. It was exhausting! My most career defining experience was playing in the Pennsylvania All-State Orchestra festival as a high school junior. I had previously been exploring a variety of potential university majors, from education to speech pathology to Spanish. After participating in the festival, I knew instinctively that I wanted to pursue a music career. I couldn’t imagine doing anything else. What attracted you to your instrument? Do you play any others? My mom actually chose the flute for me—she played during her high school years and passed her instrument on to me. My first instrument was actually the piano, which I played for ten years. Where did you train? Did you have a specific teacher or mentor who made a big impact on your music career? I completed my undergraduate studies in flute performance and music education at the University of Michigan, and received my Master’s degree in flute performance from Rice University’s Shepherd School of Music. After this, I was a two-year member of the New World Symphony in Miami Beach, Florida. The most influential teacher in my life was Leone Buyse, Professor of Flute at the Shepherd School and former Associate Principal and Acting Principal Flute of the Boston Symphony Orchestra. I first met her in Chile as a student in the Orchestra of the Americas and couldn’t believe how much I learned from her in only a few weeks. She is an incredibly conscientious, intelligent, and committed teacher and musician, and I feel so lucky to have been able to study with her for two years. Tell us your TSO origin story- how did you get the gig? What was your first rehearsal like? I first auditioned for the TSO in September 2017. Several months later, I played with the Orchestra on its Ottawa-Montreal tour. The first rehearsal was pretty nerve-wracking for me! I had flown in from Miami around midnight the night before and was sort of disoriented. However, I remember how kind and welcoming everyone in the orchestra was during the tour. It was a really enjoyable experience! What do you think readers would find most surprising to learn about the life of a classical musician or the day to day experience of playing in a symphony orchestra? Most of the work takes place outside of rehearsal. Sometimes people see my rehearsal schedule and say, ‘you only work from 10 AM-12:30 PM? That’s amazing, you have so much free time!’ What they don’t see are the hours that go into individual practice, score study, listening, and injury prevention (stretching, yoga, exercise, etc.). Being able to rehearse quickly and efficiently requires everyone to come prepared in advance, which involves a lot of behind-the-scenes work. What’s your favourite piece to play? Great question! I can’t say I have one specific favourite, although I particularly enjoyed playing Bartok’s Concerto for Orchestra with the TSO a few weeks ago. It is a highly sophisticated, deeply nuanced piece that beautifully features every instrument; the flute writing is no exception. Who is your favourite fellow musician in the orchestra and why? Definitely can’t pick just one! Of all my experiences playing with orchestras, I’ve yet to run into a warmer and friendlier group of musicians than those of the Toronto Symphony. In your opinion, what is the most unmissable concert upcoming on the TSO’s schedule? I’m a bit biased, but I’m really looking forward to playing Mozart’s Flute and Harp Concerto next weekend. Heidi Van Hoesen Gorton and I are good friends, and also from the same hometown so we share a lot of common history. We also recently formed a flute and harp duo called Steel6ix—Steel pays tribute to our Pittsburgh roots, and 6ix represents the six boroughs of Toronto. Fun fact: the weekend program’s conductor, Gemma New, and I were fellows together ten years ago at a summer music festival. I had such good impressions of her back then and am excited to work with her again. Immediately after our concert on March 10, I am going on vacation to Australia and New Zealand for two weeks. Super pumped, and hoping for some warmer weather when I return!